Re: [xacml-dev] XACML 3.0 Combining Algorithms. Subject: Re: [xacml-dev] XACML 3.0 Combining Algorithms. I just realized that email and HTML don't go well together. XACML defines a number of combining algorithms that can be identified by a RuleCombiningAlgId or PolicyCombiningAlgId attribute of the <Policy> or <PolicySet> elements, respectively. The rule-combining algorithm defines a procedure for arriving at an authorization decision given the individual results of evaluation of a set of rules. Similarly, the policy-combining algorithm defines a procedure for arriving at an authorization decision given the individual results of evaluation of a set of policies. Note there is also ordered-deny-overrides and ordered-permit-overrides which impose the order of the evaluation of the children. deny-overrides and permit-overrides are vague about the order. Appendix C describes the behavior of each combining algorithm. Here's a summary. In the case of an indeterminate, for deny-overrides and permit-overrides, then the evaluation stops. deny-overrides: in this case, if the first rule / policy returns Deny then the evaluation stops and the overall result is Deny. If I recall override algorithm can imply not applicable result. "Unless" algorithms are always resulting in a deny or permit result. 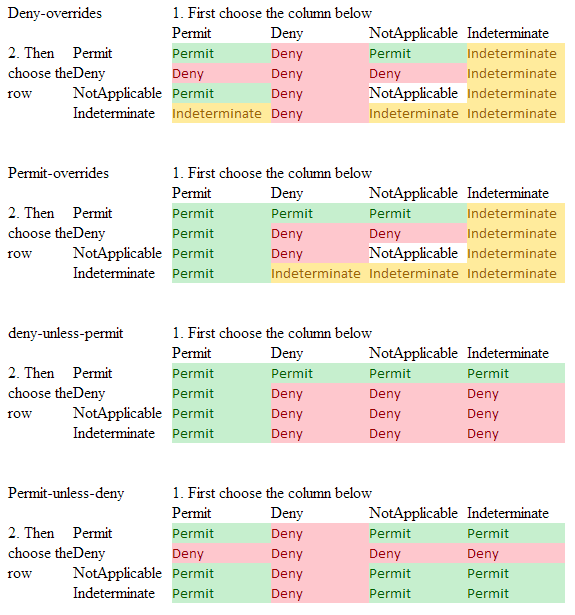 Can anyone explain the difference between " deny overrides permit " , " permit unless deny " and " permit overrides deny " , " deny unless permit ".